My name is Whitney Weiss. 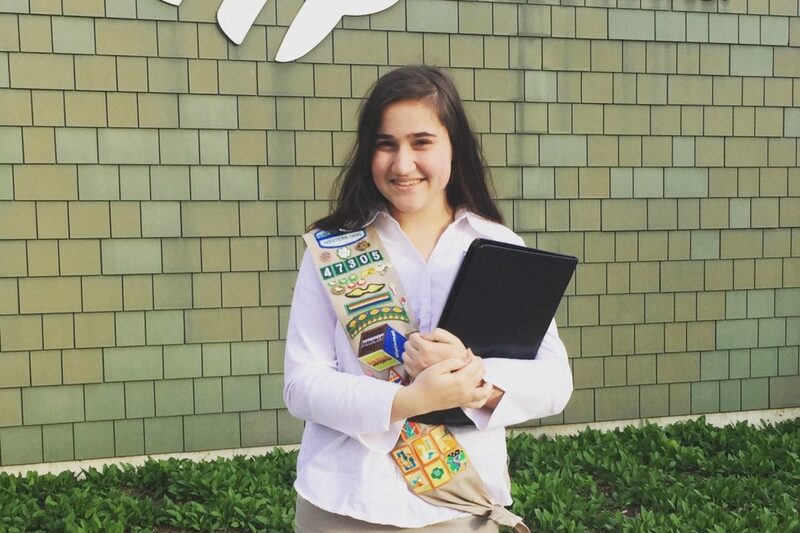 I am a senior at Mariemont High School, and I’ve been a Girl Scout for 12 years. I joined Girl Scouts when I was in first grade; I was moving to the United States from India and my mom thought it would be a good way for me to make friends and for her to meet people in our community. When I was in first grade I had no idea that Girl Scouts was more than having fun and selling cookies, but now, 12 years later, I can honestly say Girl Scouts has shaped me into the person I am today—unique, well-traveled, open minded, confident, and a leader. For that I will be forever grateful. When people think of Girl Scouts, the first thing that most likely comes to their minds is cookies; however, the first thing that comes to my mind is service. The Girl Scout Law states that we will “make the world a better place.” You may wonder how a small group of girls is capable of accomplishing such a large goal. The answer is quite simple: we work together. My troop has done countless projects in my community throughout the years. For example, we planted a garden at the library, helped with a summer reading program, and volunteered at local races and festivals. We also do service individually. I recently earned my Gold Award, the highest award a Girl Scout can earn. For my project, I addressed the issue of students being overly stressed. I did research on how to reduce stress and what negative issues occur due to stress. The biggest part of my project was bringing in therapy dogs to my high school for students to visit in between exams. I made such a difference in my school, I shared my project with other schools in my community. Girl Scouts has pushed me to make the world a better place and make important connections with adult leaders in my community. Girl Scouts isn’t only about service, it’s about having fun while gaining confidence and creating friendships. One of my favorite parts of being a Girl Scout is being able to participate in the Destinations program that allows girls to travel all over the world with other Girl Scouts who share a common interest. This summer I traveled to Namibia for two weeks with the common interest being conservation. We hiked sand dunes, explored canyons, went on game drives, and most importantly volunteered at the Cheetah Conservation Fund. I have been to seven different countries with Girl Scouts: New Zealand, Australia, Fiji, France, Switzerland, Germany, and Namibia. I have learned new things on every trip and been able to experience things I never would’ve imagined doing when I was younger. Overall, Girl Scouts is about more than cookie sales and camp outs. It is about creating a stronger community of innovative and creative girls. Girls become Go-getters, Innovators, Risk-takers, and Leaders, and there is nothing more powerful than a group of over 2.2 million girls who believe they can change the world.